AutoInfo is a transportation and logistics broker. The company operates primarily through its subsidiary, Sunteck Transport Group. Though AutoInfo plays the role of middleman, its services improve efficiency and reduce costs for both providers and purchasers. Smaller businesses often have irregular and sporadic shipping needs, so contacting Sunteck when the need arises may be cheaper than keeping a shipping manager on staff. Truckers, especially owner-operators, may not have the time to seek out clients and are always looking to reduce zero-revenue miles between loading points, so having Sunteck serve as dispatcher benefits them as well. AutoInfo is non-asset-based, meaning it does not own trucks or other transport equipment. Instead, it employs a network of sales agents who contract with businesses and transportation providers in return for commissions. The model is extremely asset-light and requires little capital expenditure. The model is also successful. From 2002 to 2012, the company grew revenues from $18.86 million to nearly $300 million, profiting in every year. Even after this tremendous growth, the company remains a tiny player in the highly fragmented $200+ billion freight industry. The company creates growth by hiring additional sales agents in new markets and incentivizing its existing agents to increase revenues. Since sales agents are compensated entirely by commission, adding additional agents creates nearly no additional overhead expenses. Twelve trailing months revenues, operating income and net income are the highest in the company’s history. Earnings per share grew 22.8% annually since 2007. The company has managed its balance sheet well. Since peaking in 2010, total indebtedness has been reduced to the lowest level since 2007. Book value has growth at a healthy rate from $0.39 per share in 2007 to $0.75 per share at present, or 15.75% annualized. Diluted shares outstanding have seen only a modest increase over the time period. 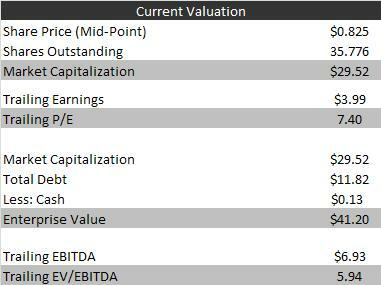 Despite a strong history of revenue and earnings growth and a healthy balance sheet, AutoInfo’s valuation is modest. A trailing P/E of 7.40 is appropriate for a slow-growing, highly indebted or deeply cyclical company, not AutoInfo. What’s more, the company trades at just 1.10 times book value despite consistently increasing book value per share at a mid-teens rate. AutoInfo’s officers and directors own 26.9% of shares outstanding, giving them plenty of motivation to grow the firm’s market value. Investors James T. Martin and Kinderhook Partners, LP own another 34.9%. Activist investors Baker Street Capital and Khrom Capital Management own 13.4% of shares outstanding and have filed a 13D. In the 13D filing, these activist investors urge management to consider a sale, noting positive acquisition trends in the freight broking industry. AutoInfo is not without a few drawbacks. Management’s compensation is high and the low float limits liquidity. The company competes with many much larger and better-known firms, though so far is has fared well. A national recession or sharp increase in fuel prices would reduce its demand for services as well as its available suppliers. On the whole, AutoInfo presents an opportunity to buy a growth company at a value multiple. If the company is successful in executing its plans for growth, investors may be rewarded when the market eventually appreciates AutoInfo’s results, or when the company is sold to a larger competitor. Thanks for the writeup and I agree this is a very interesting company. I do think however that a lot of these 3pl players are beginning to discount a recession to some degree as they are all vulnerable to shipping volumes so while their working capital needs are reduced and margins can temporarily benefit from a slowing economy, their organic revenue and earnings can be impacted quite dramatically. Sounds like you know a good bit about the industry. Can you suggest some other companies to look to for insight on industry trends? Does anyone have any information regarding AUTO’s Operations and systems? I am confused by the difference between the brokerage services v. contract carrier services. “In our brokerage services, our sales agents throughout the United States and Canada receive customers’ freight requirements daily. All agents make appropriate carrier arrangements for the pick-up and timely delivery of customers’ freight. I like the valuation on AUTO and statistical exhibits, however I don’t understand the future of the industry. The little research I have done on the industry seems to worry me a bit – at least in the short term. CHRW – the largest non-asset 3PL has been reporting margin compression for the past year. “I talked a couple of times now about net revenue margin compression, and the fact that we’ve had it for 3 years in a row now based on our transportation summary that we put out there. Just a thought that I’d like to share around that, as I said earlier, it’s very difficult to predict what’s going to happen in the market and what’s going to happen with those net revenue margins. But one of the things that I think is important, if you look at how we’ve responded to these changes over the last 3 years and how we expect to continue to respond to the net revenue margin opportunities, is that we are very focused on taking market share and growing our business. When we think about all of the factors that come into the net revenue margin compression around a very balanced market for a sustained period of time, the mix shifts in the business to more dedicated, more intermodal, more static route guys with a lot of the shippers. When you look at the competitive factors and all of the technology changes that have occurred with shippers and electronic bids, we’ve received a lot of questions over the last couple of years about the impacts of all of those on our net revenue margins. And while it’s very difficult or impossible to isolate or quantify the specific impact of any of those, we have made the clear choice that we are going to continue to grow our business. And if the market continues to be difficult and generate net revenue margin compression for us, our strategy is to accept the productivity challenges that come with that and continue to invest in our technology, in our account management and business process opportunities to make our model more effective and more competitive going forward. If anyone cares to share their view on the long term future of the industry, I believe we can form a clearer picture of the quality of the investment opportunity in AUTO.